Very pleased indeed with all aspects of our tour. For us everything went like clockwork from being picked up at our hotel to being dropped off. Thanks to all involved but in particular Sanjeeta who was excellent. Her enthusiasm ,knowledge and kindness were outstanding and she ensured we had a very fulfilling day in Dehli. We had a pre prepared list of things we wanted to experience and she more than accommodated us .lunch is not included on the tour but Sanjeeta and our driver went out of their way to ensure we were accommodated. Sanjeeta was happy to answer any questions we ask .She was also happy to take photographs of us which we found helpful . We couldn't fault this tour. We got what they said we would and then some. Overall this was a fantastic way to see the sites and sights of the city according to one's own desires. By my own omission, I showed up without having done any meaningful research on what was to be seen, but my guide, Rakesh, was fully knowledgeable and helpful from the outset in setting up an itinerary to see the types of places in which I was interested. I not only got to learn about the history of each place we visited along our route, but I was also particularly impressed with my guide when I pointed out that I was an avid birdwatcher, at which point he indulged me by helping me identify our feathered friends as we passed through all the various parks and grounds. Thankfully I've more than just one day to see the city, but if one day is all you have, for the sake of comfort and flexibility, I say this is the tour for you. Our guide met us at our hotel and we told him the sights we would like to see. He made some recommendations which we agreed to. His insight into the religions and history of the various sights made the tour very interesting. Overall it was a great trip. The tour around Delhi was nice covering the most important things to see. The tour guide did a good job and was funny as well. The guide met me on time in the lobby of my hotel. 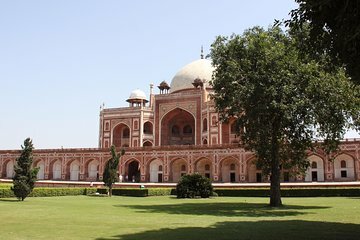 I had a list of places I'd found on a 50 best places in Delhi blog. We went over them and made an itinerary of the most places I could see. We went to Humayun's tomb, Old Delhi 6, Lotus temple, sikh temple, Raj Ghat and Jama Masjid. It's not made clear, but I finally figured out I was supposed to buy my guide lunch. I wasn't hungry and I kept putting him off and then after searching on the internet I found a place I would go for lunch. I then realized I was to share my lunch. I thought it was funny. I wished I knew before the tour, so I could have done research on a lunch place the night before. The driver of the car was very good. There is a driver and a guide to tip. I also gave the guide a little bit of cash so he could pay for rickshaws, street food, and drinks at his bargaining price. That took a lot of stress off me. I had a good time, learned a lot and got a good feel of New Delhi. I would do this tour again with another list. 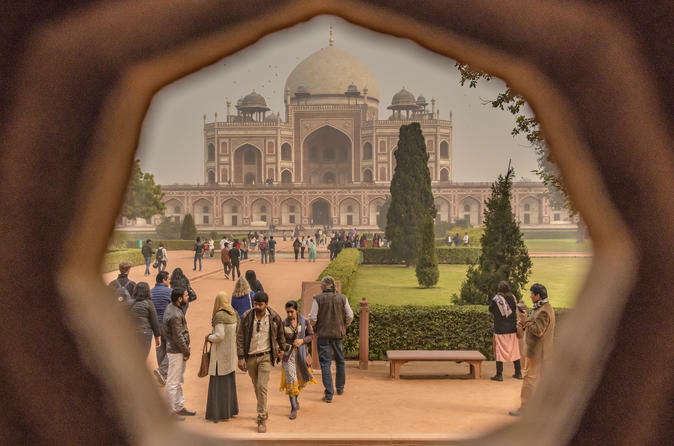 The Day Tour of Delhi was everything we expected and then some. Our guide was Jestain and he was very knowledge and enthusiastic. The highlight was our tour of Old Delhi and the spice markets. We saw some incredible sights and could really get a feel of the city and it's vibrance. Absolutely perfect despite the rough start. Our Tour Guide did a fantastic job. Everything worked perfectly. Sammy was a great guide - very good English, and very knowledgeable. This was on our first day in Delhi, and it gave us a good introduction to the city. We stopped off for lunch at a small local restaurant no idea where!, but the food was excellent. Make sure you have cash with you - R 500 per person at each of two sites, lunch a few hundred rupees each, and around R 500 for rickshaw and the electric Tuk-Tukky thing. One of the sites and the small restaurant accepted cards, though. You also pay for the guide's entrance fees, but these fees for Indians are very small only R 30. The itinerary makes it clear you pay for these, so no surprises - but doesn't give any idea of how much you need to take. If you can, leave any backpacks etc. in the car for the Old Delhi bit - otherwise you'll be advised to wear them on your front. Well run tour. Annie was engaging as a tour/host and we appreciated his knowledge of the various locations. Driver and tour guide bent over backwards to show us the most they could within the timeframes of the tour - Their understanding of traffic patterns and openings of the various tour spots allowed us to maximize our time in Delhi and see as much as we could. We also enjoyed the safe street food advice as we loved eating the local food and not getting even a wee bit ill.
Don' bother wasting your money on this tour. The guide was not a registered guide so he was not supposed to be guiding when we got to each of the sites. He would allow for me to go through the entrance and then meet up with me only once we were well inside. The guide also had very limited knowledge of each of the sites and was not really able to explain anything. Reading the boards was far more useful than having a guide. If all you are expecting is transportation from one site to the next, this is the tour for you but if you are actually looking for a guide to help explain what you are seeing, I suggest you look for another tour.